A toast is a view that provides quick feedback for the user in a small popup. Normally, Android toast is displayed at the bottom of the screen but you can also change the position. 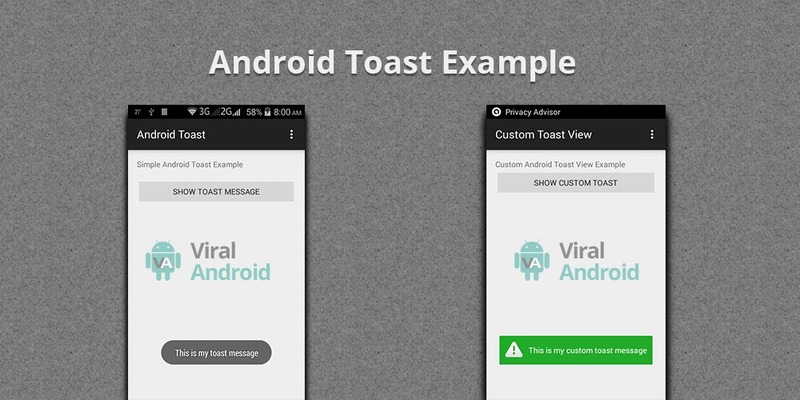 In this example, I will show how to use custom toast in android app. Custom android toast allows you to display little message with small image icon and lot more. With custom toast, you can change toast background color, text color and style and even more. You can use Snackbar instead of toast. Snackbar is similar to toast with even more features. Just follow the following simple steps to display custom android toast message. To display custom toast, you have to create an xml layout file and add what you want to display in the toast. Here, I have created a custom_toast.xml file and it looks like this. Add a button to your activity_main.xml file and it looks like this. This is the modified code of java activity. The job you have to do is over. Now, run your application which looks like this.